At These Caribbean Airports You'll Feel 'Tranquility Wrapped in Blue"
Whether you’re planning to party with 100 of your closest college friends in Daytona Beach, seeking solace at a family-friendly resort in Hilton Head Island, or planning a relaxing getaway in the Caribbean, you won’t want to miss a minute of sun during Spring Break. Losing time on the beach to a flight delay is the last thing you want to worry about during your hard-earned break, but unfortunately it does happen. In 2016, two out of every 10 flights were delayed on the peak travel days of Friday and Saturday to top Spring Break destinations in the U.S., according to AirHelp data. Read on for our analysis of where to go before everyone else does, so you don’t miss a minute in the sun. Americans usually find themselves in one of five regions when seeking sun and sand for Spring Break – California, Florida, South Carolina, Texas and the Caribbean. But with popularity comes congestion – and potential travel headaches for you. AirHelp has analyzed the on-time performance of flights to 27 airports in these destinations during the past five years (2011-2016). We sought out trends during the peak Spring months of March and April to see which places come out on top. Based on this data, we’ve estimated the best airports to use to get you to the beach on-time, and provide tips for the savvy traveler. Here’s a look at what we found. Despite its laid back vibe, the Caribbean nations sure do know how to get you to the beach on-time. In 2015, a huge influx of flights started to arrive into the crystal blue islands, in some cases more than doubling the air traffic. Even still, flights into and out of the Caribbean have “stayed in the blue” and have consistently maintained the best on-time performance of all the regions studied. Last year, the Caribbean boasted its lowest on-time percentage rate (84%), which still outperformed the other regions we studied. This slippage was mainly attributed to scheduling on the heavily-trafficked days of Friday & Saturday. Henry E. Rohlsen Airport in St. Croix (STX) has the lowest on-time performance in the Caribbean (75%), followed closely by Owen Roberts International Airport, Grand Cayman (GCM). There are still others to consider, too. If you’re headed to St. Martin or St. Maarten – you’re in luck. Both destinations are located on one island (shared by the Dutch and French, with no border patrol! ), and are home to the Princess Juliana Airport in St. Maarten (SXM) and the L’Esperance Saint Martin Airport (SFG). Both airports are good bets with a 90% on-time performance or higher, which is no surprise considering the Caribbean’s peak performance overall. However, if you want to make sure you don’t miss a minute in the sun, L’Espérance (SFG) is the way to go.For the last six years, ithas had the highest average on-time performance during Spring Break season, and in 2016 almost 10 out of 10 flights arrived on-time. Not bad for the airport that serves as the main link to most of the French islands in the Caribbean. Likewise, 9 out of 10 flights arrived on-timePrincess Juliana Airport in Saint Maarten(SXM) in 2016. Princess Juliana isfavored by airline passengersfor its courteous staff and clean and organized facilities – it currently boasts a 4.6 out of 5 star rating on Google. We’ll take those odds! Insider Tip: If you are flying to St. Kitts and Nevis, Vance W. Amory International Airport (NEV) is the best bet, but only slightly. 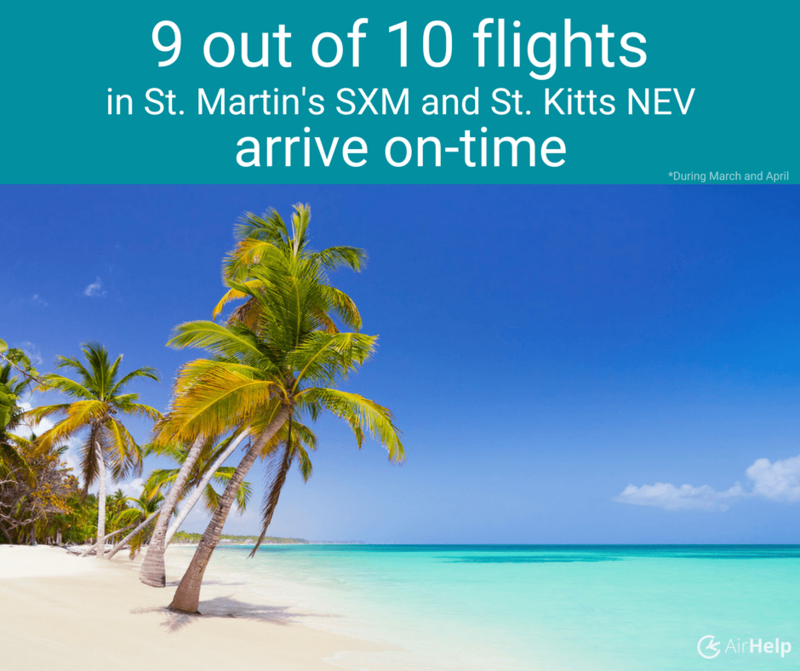 Last year, 9 out of 10 flights arrived on-time to NEV, compared to 8 out of 10 at Robert L. Bradshaw International Airport (SKB). Additionally, airline passengers flying into and out of Bradshaw had some interesting experiences, to say the least, “I have some unique memories of this airport. From seeing a pilot walking around with some pepper rum or a flight that was in the middle of a tropical storm,” said one reviewer. SKB is rated 3.3 out of 5 stars, as compared to Vance Amory’s 3 out of 5 star rating, which is perhaps due to its single runway. It’s no surprise that California is among the top warm-weather destinations on our list, but it might surprise you to know that flights into Cali have consistently scored over 80% in on-time performance during the past 6 years. This is quite the feat considering shear square miles covered and airports tallied. Perhaps this is due to its year-round warm and sunny weather – not too many Californians need to escape to southern destinations for a March or April respite. Nevertheless, if you’re planning a trip to California, there’s no need to choose between North and South. We recommend renting a car and doing some exploring by first flying into San Jose Norman Y. Mineta International Airport (SJC) and driving about one hour to San Francisco, which could save you time by avoiding delays in SF. In fact, San Jose International – colloquially known as “Silicon Valley’s Airport,” had an average on-time performance of 90% during the past 6 years, while San Francisco International Airport (SFO) had an average on-time performance of 76%. 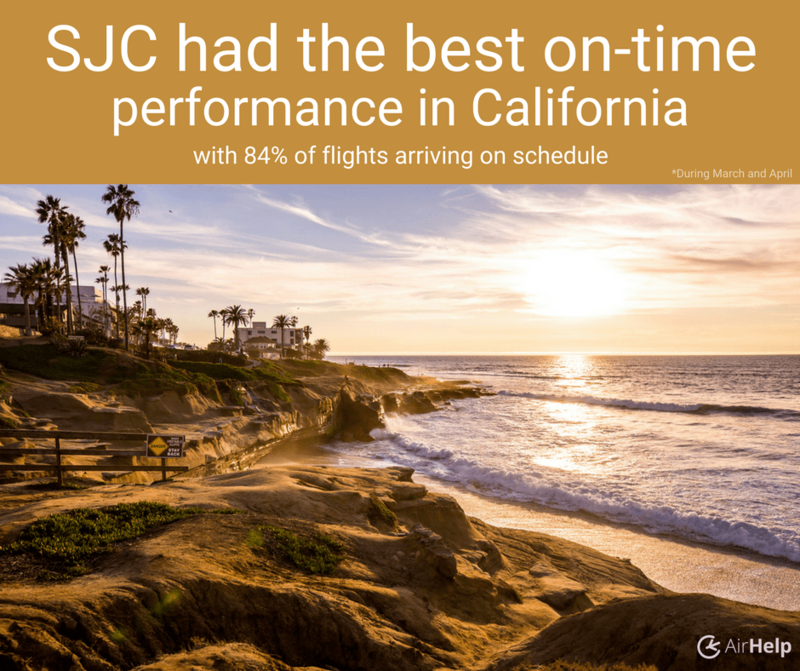 Last year, SJC also had the best on-time performance in California – 84% of flights arrived on-time. Rounding out the list are San Diego International (83%) and Los Angeles International Airport (LAX) with (81%) in 2016, which are great options, too. If you’ve set your heart on the Sunshine State, you’re going to need some tips. We don’t want to offend the sunny south, but Florida and its Southern neighbors are not known for punctuality. Of the Southern state airports we looked at, Florida and South Carolina are the two popular warm-weather destinations with the lowest on-time performance rates in the past year. Florida has 80% on-time performance over the past 6 years in total, however on-time performance has dropped from 85% in 2011 to 72% in 2016. There are still beautiful beach destinations in these regions, and we’ve outlined our tips below to avoid delays. Hint: Book flights for Tuesdays & Wednesdays. It’s a good bet to fly into Key West International (EYW) and Daytona Beach International (DAB) airports, as both have stellar on-time ratings of (91%) and (85%), respectively in 2016. For better or worse, most Americans picture Daytona Beach when they think of Spring Break. The vacation spot is known for its bikini contests, cheap hotel rooms and around 20 miles of beaches that have been reimagined multiple times on the big screen. Daytona ranks #2 in the “Best Cheap Spring Break Destinations” and #9 in “Best Spring Break Destinations” by U.S. News & World Report. Its airport boasts a very high rating by travelers (4.6 out of 5 stars), for being easy, efficient, professional and polite staff. Furthermore, Key West International Airport, while not very sizable, has benefitted greatly from a newly refurbished terminal and friendly staff. Most passengers lament how expensive ticket prices are flying into and out of Key West and with the outdated check-in kiosks. Insider Tip: Ft. Lauderdale-Hollywood International (FLL) and Miami International (MIA) Airports both have very similar on-time performance rates (80% and 82% respectively) in 2016, so you can’t go wrong either way if you’re heading to South Florida. Find a cheaper flight to FLL? Go for it! Miami International is the shining star of the Sunshine State – as it is by far the most popular and well-known destinations for the beach-bound. However, it struggles in customer service due to its sheer size and busyness. A majority of the complaints are around navigating its vastness, outdated design, luggage handling and gate availability. Overall, travelers give it 3.7 out of 5 stars. Don’t forget poor Ft. Lauderdale-Hollywood. The airport stands in the shade of MIA in more ways than one – not only is it lesser known, but it’s also located 21 miles north of Miami. However, the airport holds its own for both on-time performance and overall service rating with passengers giving it 3.7 out of 5 stars. It rates well in accessibility, easy navigation and superb treatment of airport staff, but lost points for airline staff, luggage handling and lack of seating. Insider Tip: Flying to St. Petersburg/Tampa area? 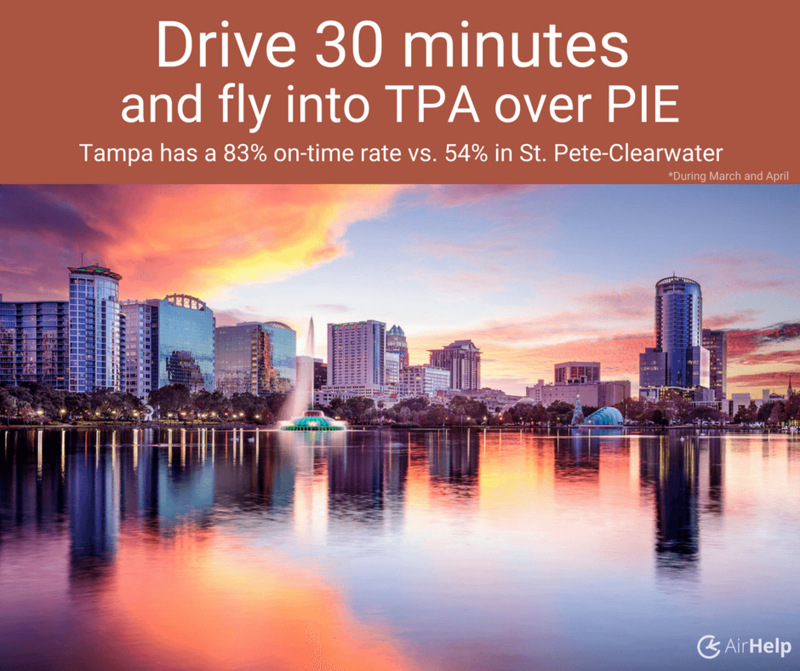 Avoid St. Pete–Clearwater International Airport (PIE), and opt for Tampa International Airport, instead (TPA). The two are just a quick 30-minute drive apart, and Tampa has a more reliable on-time performance rate of 83%. Tampa is also the preferred airport of the passengers as it has 4.5 out of 5 stars in customer ratings, with compliments on the ease-of-use of its design and layout, exemplary food and services offerings and efficient and safe security. St. Pete-Clearwater, on the other hand, had the lowest on-time score of all the airports in our research, with only 54% of flights on-time in 2016. The airport also suffers from an average delay time of 50 minutes. Passengers have been known to complain on on review sites about unnecessarily long wait times at the luggage carousel and several service offerings being closed in the middle of the day. For all intents and purposes, South Carolina is home to as many top Spring Break destination beaches as Florida. This is because Myrtle Beach and its famed “Grand Strand” are the hottest spots for college coeds to celebrate the annual rite of passage of Spring Break at its countless area bars, clubs and nightlife spots. 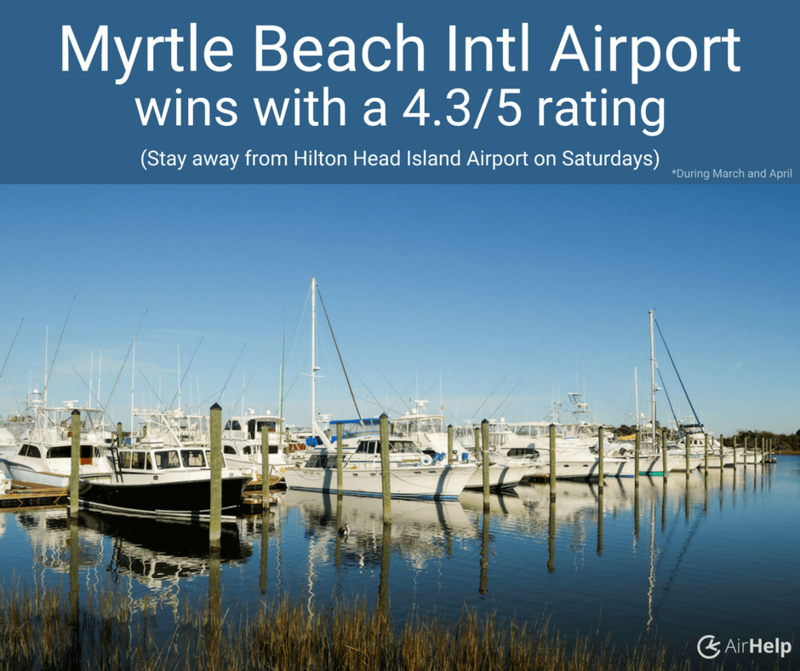 Despite its reputation, Myrtle Beach deserves a gold star for its airport, Myrtle Beach International Airport (MYR), with nearby Savannah/Hilton Head International Airport (SAV) coming in as runner-up. Both score relatively high in on-time performance rates (mid-80%), for the overall Spring Break season, but travelers to Hilton Head Island Airport (HHH) may suffer greatly depending on the day they travel. Hint: Don’t fly into Hilton Head Island Airport on a Saturday if you can avoid it – you’ll have a 35% chance of your flight being canceled or delayed. Regardless, those seeking shade under the palm trees had only positive feedback for MYR, leading to its 4.3 out of 5 star rating for efficiency and navigation; and the same goes for those traveling through SAV with its 4.2 out of 5 rating for its convenience and reasonable security lines. Insider Tip: If you’re traveling to Hilton Head Island, fly into Savannah/Hilton Head Airport (SAV) as opposed to Hilton Head Island (HHH) to save yourself delays and headaches. It’s about an hour from Hilton Head, however its 84% on-time performance rating in 2016, is significantly higher compared to the 58% on-time performance at Hilton Head Island and many resorts will even provide transportation from the airport. If not, check the airport shuttle listings for private shuttle services, just make sure and make a reservation – shuttles fill up during Spring Break season. On the opposite end of the spectrum, you might want to consider grabbing your cowboy hat and heading to Texas this year. Not only is it relatively low traveled, it’s also a good bet during peak Spring Break season, with 8 in 10 flights arriving on-time during the past 6 years. 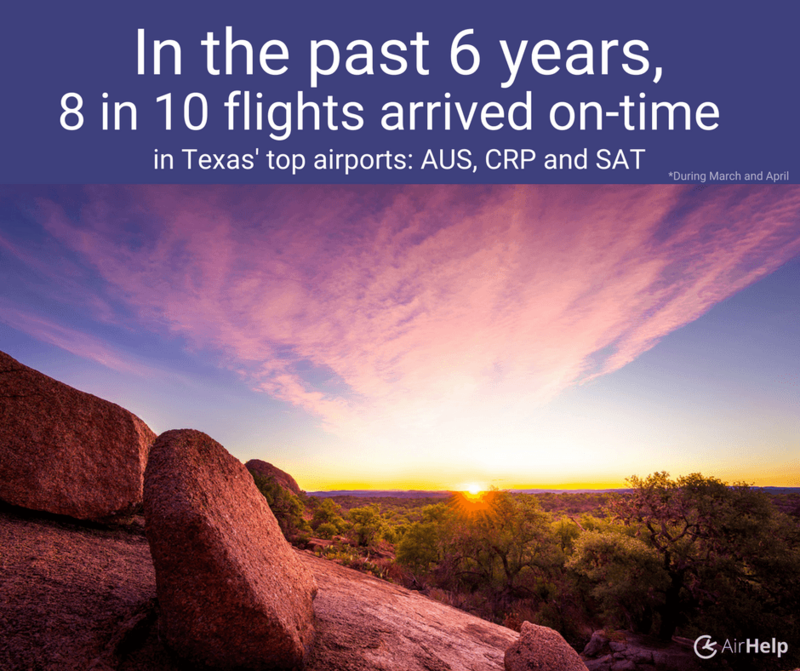 Here’s how the top airports shook out in terms of punctuality; Austin–Bergstrom International Airport (AUS, 82%), Corpus Christi International Airport (CRP, 81%), and San Antonio International Airport (SAT, 82%) are all great options for a warm-weather trip. A word of warning, however – avoid flying on Fridays & Saturdays as nearly 30% of all flights are delayed those days! Now that you know which regions and airports you can maximize your sun time at, check out our annual AirHelp Airline Score to determine the best airline to fly, and don’t forget your SPF! To do this analysis, we chose 5 popular spring break regions in/near the US (California, Caribbean, Florida, South Carolina, and Texas), and then narrowed our search down to the top destination airports in each region. We used commercial flight status data for all direct flights originating in the US and arriving at the destination airport. We then looked at the percentage of on-time flights (less than a 15 minute delay), over the total flights scheduled to the destination airport, which gave us the ‘on-time performance’ rate. We looked at the data over the past 6 years (2011-2016), during March and April as those months are peak spring break season.